It is noon of any given Sunday. You find yourself at a local bar in your neighborhood and you ask for a vermouth and something to nibble. And as it couldn’t be any other way, the smartass of the day makes an entrance: “That’s pure chemicals! Do yourself a favor and get a real wine”. Do not despair, remember that smartasses are like hydras: chop the head of one, and three will take its place. To help you fight that scourge of society, today we are going to give you the tools to give him an appropriate answer. Where shall we begin? Any given wine is no more than the fermented juice of the grape. That is to say that we add yeast to the juice, and these transform the natural sugars into alcohol. It is true that there are more steps in the wine making process, but that is a story for another time. To obtain a fortified wine we must add some type of alcohol (brandy, cognac or any other hard liquor are the most common) during the fermentation of the juice. This way yeast dies before they have had the time to consume all the sugar. As a result, we will obtain a wine with a higher alcohol content (around 18%) and naturally sweet (since there are no added sugars, only those remaining from the grape juice). Once fortified, it is time to add the herbs and spices (and even fruits and roots). It is a rather long list: clover, pansies, raspberries, aspergillum, anise, cardamom, lily’s root… which ones you use and in what amount is a decision for the enologist to make. However, there is a plant that is essential to be able to call our beverage vermouth: absinth. The word vermouth comes from the German wermut which means absinth. It is from this term where the drink gets its name. Remember this, as one day it might help you win a pub quiz. But if most vermouth is produced in Spain, Italy and to a lesser extent in France, why the German name? There will be many that will insist that vermouth is something rather recent (XIX century), the truth is that it goes way back. We find the first historical reference to a beverage similar to modern day vermouth in De Re Coquinaria, a recipe book in Latin from the V century, attributed to the Roman author Marco Gavio Apicio, with a selection of spices quite similar to the current one, but without fortifying the wine. This kind of wine stopped being popular during the Middle Ages in most of Europe, with the notable exception of Germany and Hungary where high quality wermuts were being produced, in which the absinth macerated for at least 72 hours in high quality wines (this will become important later). During the XVI and XVII centuries the first fortified wines were produced (without the addition of any kind of spices) with the purpose of making them more resistant to long ship journeys, so they could be transported from the countries of production (mostly southern Europe) to where they would be consumed (northern Europe or the Americas). Throughout the XVIII century, a new beverage is becoming very popular in Italy. A beverage that combines a fortified wine with a selection of herbs and spices where absinth is predominant (probably influenced by the popular wermuts from northern Europe). Despite being attributed the invention to Antonio Benedetto Carpano in 1786, the truth is that there were already some recipes written in 1773 when Carpano was merely 9 years old. What we can thank Carpano for is the popularization of the drink. It was one of his vermouths that ended in the hands of Duque Vittorio Amedeo III, whom included it as the official liquor of the royalty dethroning Rosolio (yes, kings have official liquors. Marketing was invented long ago). 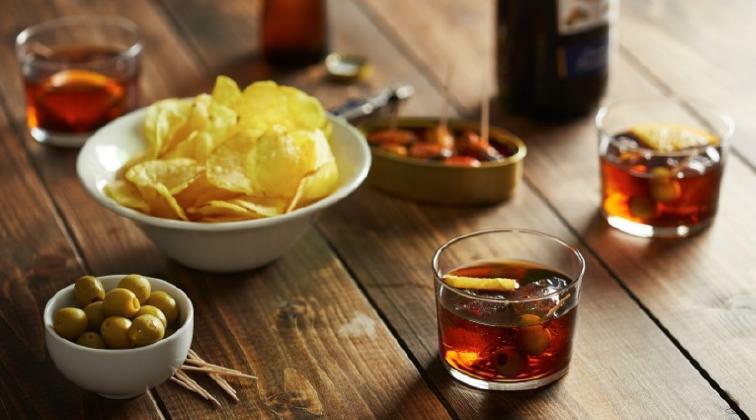 But if vermouth as we know it was born in Italy, why is it known by its German name? I’m glad you ask, Perkins. It is something quite simple, actually: the Italian name sounded quite vulgar. Vino di assenzio sounds like something your grandpa would drink to cure a colic, whereas vermouth (Italianization of the German term) has an exotic ring to it, worthy of any hipster.